If your door slams shut unexpectedly, or becomes particularly noisy while it's moving, odds are something is wrong with your springs. These components are incredibly important, but also highly dangerous, and therefore they must only be handled by professional technicians. Whether you have a pair of extension springs or one torsion unit, you will most likely need the assistance of an expert. A broken spring will render your door inoperable, and may even cause it to collapse if you try to open. Performing the required replacement task is dangerous, which is why you should leave things up to our specialized technicians. A great way to prevent a lot of issues is to make sure these components are properly taken care of on a regular basis. Our maintenance experts will examine the tension of your springs and adjust it as necessary in order to keep your door from getting unbalanced. We'll also lubricate these crucial components to keep their performance silent and efficient. This will not only help them continue functioning for much longer, but also extend the longevity of other parts of your system that could suffer from collateral damage when a spring breaks. 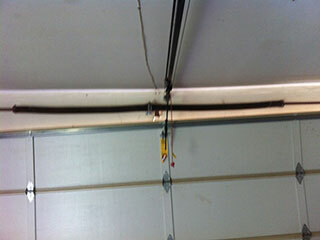 Extension springs stretch while the door closes, and they then use that tension to open it back up by contracting. Two are usually installed, one on each side of the door. A torsion spring (usually only a single unit is used) uses torque in order to do the same thing. It twists and unwinds instead of stretching and contracting, and therefore is far less likely to whip around when it breaks. Spring problems aren't worth the risks they pose. That's why you should reach out to our team at Garage Door Repair Duluth whenever you experience an issue with these components. Simply give us a call and we'll be on our way.